Ther. Wednesday, Jan. 25, 1888 Wea. Not as cold, some snow last night but quite bright day. Tho' blustering Leonard still poorly from cold, but up & about. Others appear as well & at usual duties much as ever. 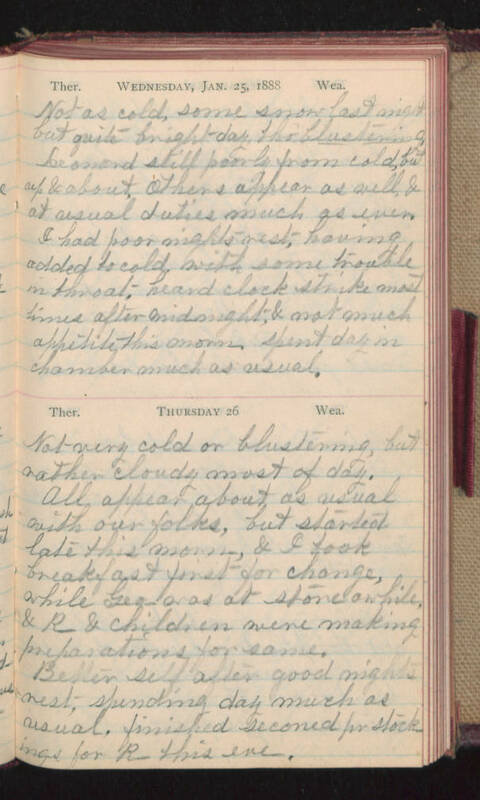 I had poor night's rest, having added to cold with some trouble in throat; heard clock strike most times after midnight & not much appetite this morn. spent day in chamber much as usual. Ther. Thursday 26 Wea. Not very cold or blustering, but rather cloudy most of day. All appear about as usual with our folks, but started late this morn., & I took breakfast first for change, awhile Geo. was at store awhile & R_ & children were making preparations for same. Better self after good nights rest, spending day much as usual, finished seconed pr stockings for R_ this eve.